We raise Pastured and Forest-grown Pigs, rotationally-grazed Grass-fed Cattle and Log-grown mushrooms with an emphasis on land and community regeneration. We believe that our food is our medicine and the soil under our feet is the birthplace of all nourishment for us and beyond. We strive to bring our customers food that will bring health and build soil for future generations of life. 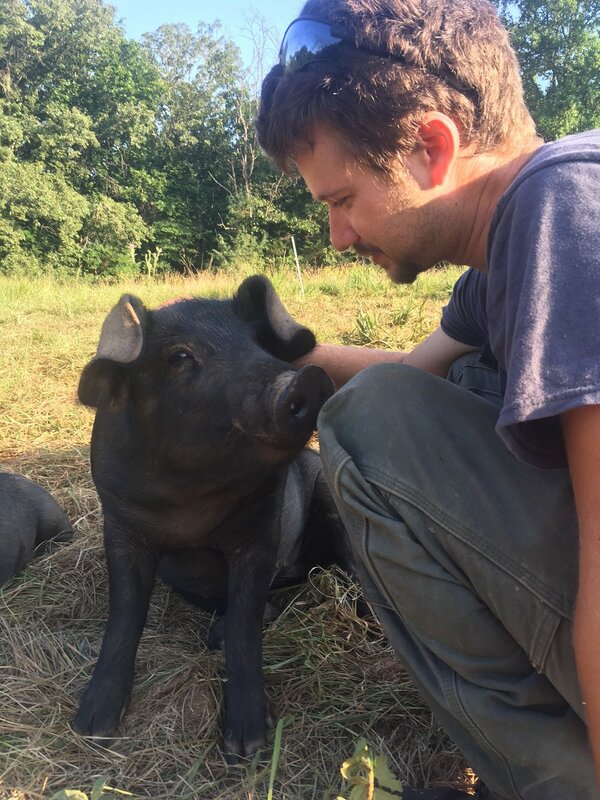 Our herd is a diverse batch of heritage breed pigs including Tamworth, Glocester Old Spot, Large Black, Berkshire and Duroc that we raise on the rolling hills of Alblemarle County. 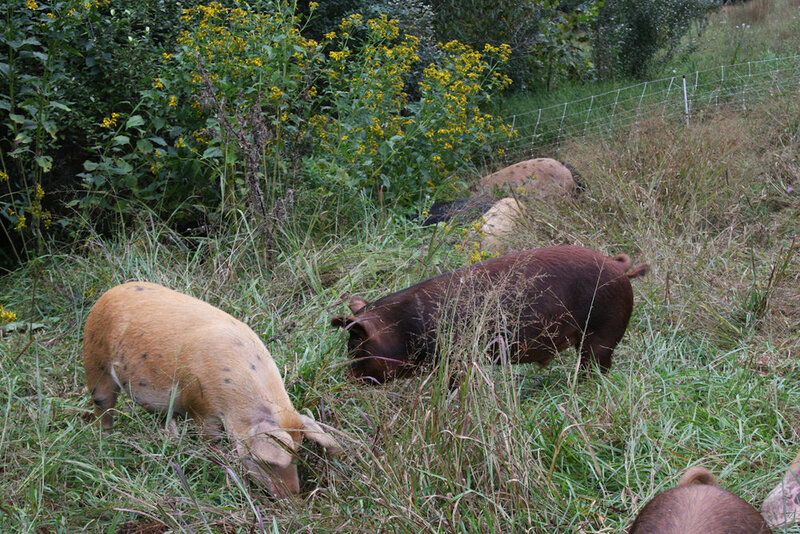 We rotate our pigs on pasture and through the forest, where they have access to a diverse array of nutritious forage including; grasses, forbs, acorns and other tree nuts, roots, shoots, wild fruits, insects and mushrooms. We supplement their diet with a ration of locally grown non-gmo grain. The nature of a pig is one of curiosity and seeking delicious omnivorous treats, much like us! This, combined with their stature, makes for a creature that is able to bring about great change in the landscape while following their nose. We recognize this as a great attribute of pigs, but if left untended, can lead to an unsightly and unsound ecosystem. Therefore, we place great emphasis on stewardship aimed at maintaining and improving soil depth and health, rotating our animals frequently based on ground-cover and soil disturbance amongst other factors. We typically move our pigs 1-2 times per week with a goal of maintaining a substantial percentage of vegetation after they have moved through. This, combined with long rest periods for each paddock before they are grazed again, possibly multiple years, creates a harmony of disturbance to bring about more diversity and richer soils in our pastures . We believe many pig producers allow for too much disturbance. This often leaves the soil bare for extended periods which can lead to extensive erosion (soil loss), overly compacted soils, polluted water ways (excessive nutrient/manure runoff and erosion) as well as simply a lack of plant forage for the pigs to eat. We know that the flavor and color of our pork reflects our management and is a major perk to the ecological mosaic of disturbance that our pigs create as they pulse through the landscape; improving the quality of our pastures for generations to come, including cattle next year! In addition to our commitment to animals, soil and nourishing food for our community, one of our goals is to provide our customers with a simple, resilient, nutrient dense option to feed family and friends. That's why we have designed a variety of bundles that we hope will suit the needs of our diverse customers. Experiencing the broad range of cuts, in proportion to how they are found within animals, is an important connection in our fast-paced lives. We believe this is a way for our customers to be more in touch with the food they eat and the land that supports us. If you're interested in our products, please visit our Farm Shop or send us an e-mail at Wanderingriverfarm@gmail.com. You can also view our retail price list for items found at the farmers market or special order. Wandering River Farm began in the late Spring of 2016 by Gabriel Engle and Kelly Walsh as a avenue for them to share and further their commitment to regenerative agriculture. They have pasture and forest-raised pork, pasture raised Eggs and Grass-fed Beef available for their buying club customers via the their graze-cart site and packages available on their farm store. You can also find them at the Charlottesville City Market every Saturday until Dec 23 from 7am-noon where you can also purchase their log-grown mushrooms in addition to their array of nutritious offerings grounded in land and animal care!